Hey hey! 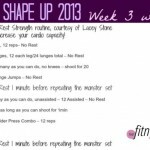 You’re CRUSHING this year’s Winter Shape Up challenge! Keep up the amazing work! I’m loving all of your check-ins and comments here on the blog and in the Facebook group. Don’t forget to enter the Sunbasket giveaway each time you compete a workout this week. If you’re just now joining in the party, get all the info here! Here’s what workout #6 looks like! It’s a super sweaty total body workout, split into 3 circuits. 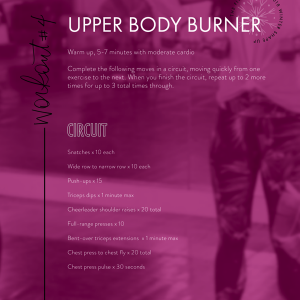 Warm up with 5-7 minutes of moderate cardio, then head into the first circuit. Complete the exercises in the circuit, moving quickly from one exercise to the next. 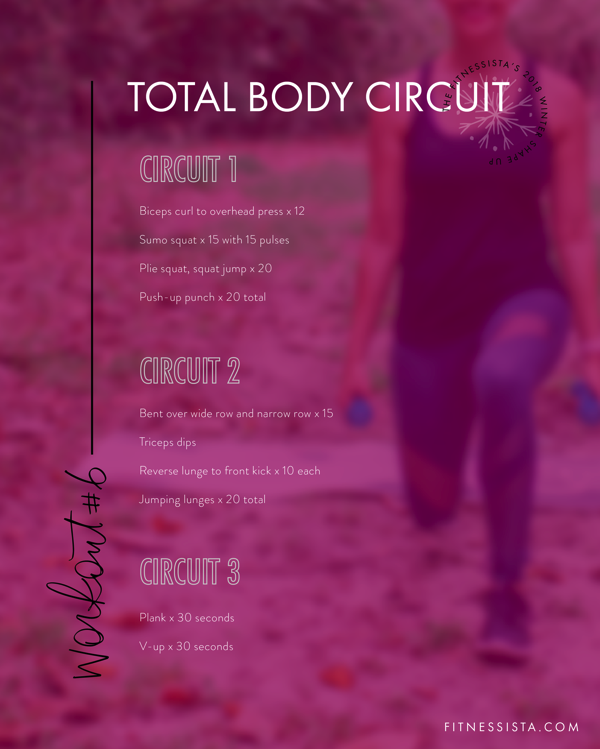 When you finish a circuit, you can repeat it up to 3 total times before heading to the next circuit. Biceps curl to overhead press x 12: Holding a dumbbell, squeeze your biceps and exhale as you curl, inhale to bring the weights up to 90 degrees, and exhale to press up overhead. Sumo squat x 15 with 15 pulses: Start with your feet under your shoulders and sink into a deep sumo squat, bending your knees so your thighs are almost parallel to the floor. Your knees should extend towards your toes, but not over your toes. Repeat 15 times, then hold at your lowest position and pulse 15 times. Push-up punch x 20 total: Start on your knees or toes, with hands wide and knuckles pressing into the floor. Keep your hips down as you perform your pushup, exhaling on the way up. As you rise, punch the space in front of you with one arm. Place the hand back down before your next pushup and repeat on the opposite side. Bent over wide row and narrow row x 15: Your feet will be just under your hips with a slight bend at the knees. Hinge forward from your hips, keeping your back flat (shoulders pulled back) and core braced. Lifting up from your elbows, bring them high and wide, engaging into your rear delts. Stop the elbows at shoulder height before carefully lowering back down. For the narrow row, squeeze the elbows in and keep your arms from lifting higher than your torso. Inhale to lower down with control. Triceps dips: For a more challenging version, place a flat plate on your legs. To modify, bend your knees. As you complete your dip, make sure that your elbows stay pointing straight back, keep your chest lifted, and shoulders down. Reverse lunge to front kick x 10 each: Use your core to lift your leg and flex your foot to press it away from you. Keep your chest lifted and torso upright as you lunge. Finish on one side before switching to the other side. Jumping lunges x 20 total: Step one leg back and lower knee into a lunge position. The front knee should be behind your front toe. Spring up and switch legs. Make sure to land with a soft knee and sink into your lunge before springing up. If the impact is too much, try quick and efficient lunges. Plank x 30 seconds: Make sure that your body is in one straight line from your head, all the way back through your knees or toes (depending on whether you’re modifying). If you’re on your toes, press back through your heels. No matter what, keep your hips in line with your spine. Tilt your chin away from your chest so your neck stays long, and take some nice deep breaths. V-up x 30 seconds: Focus on keeping your transverse abdominis engaged as you perform this exercise. As you crunch up, you should pull your belly in instead of letting it pop out. Exhale and think about drawing the belly button towards the spine. Loving this year’s WSU!! How many reps for the tricep dips? Loved it indeed. I went for a 30mn steady fun after that. 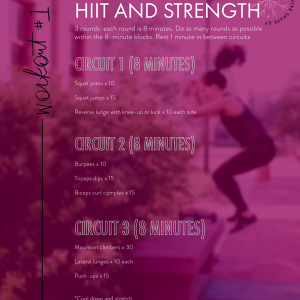 It’s the first time I paired à strength circuit and a run…my legs were obviously a bit tired but I felt my core in an interesting way, as if They were holding me mord strongly than usual. Thanks Gina! Two words about this workout: OH MY! And it says to move quickly… I’m afraid I’m moving a bit slower than “quickly!” My body is dragging especially when I go from floor to standing as in the push-up to punch. I’m all in, but I reeeeally need to get in shape! Onward…. 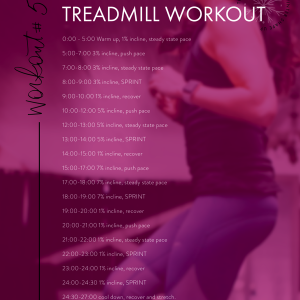 What pregnancy modifications do you suggest for circuit 3 (or any of them for that matter)? Thanks for putting this together Gina!! I’ve lost 1.5 lbs! Yayyy!